Hello, Petunia is a little wary around strangers, but once she knows you, Petunia loves to purr and cuddle in your lap while being petted. Along with a sweet personality, she is affectionate, gentle and enjoys playing with toys. This little princess prefers to be an only cat, but has shown a liking for very young kittens. 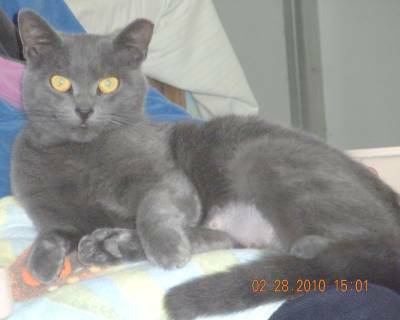 Description: Female, short hair solid gray with big golden eyes, petite, a Russian Blue look alike. Microchipped.